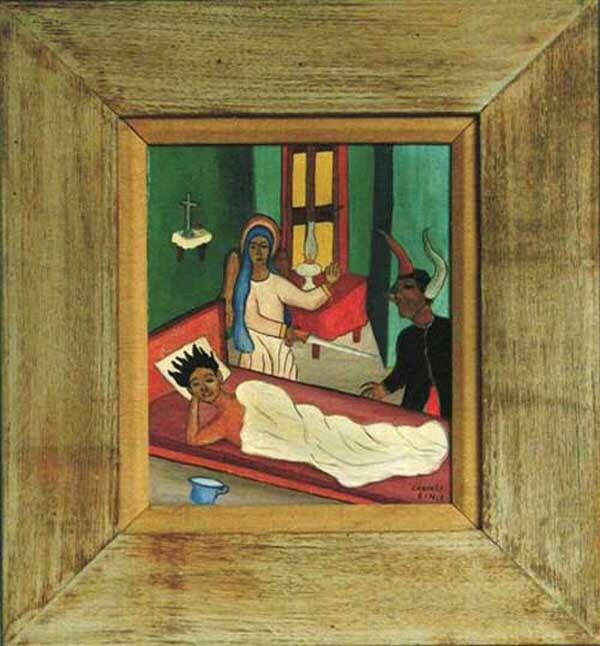 Castera Bazile was born in Jacmel, Haiti in 1923. He found employment at the newly opened Centre d'Art in 1944 as a general maintainance man. 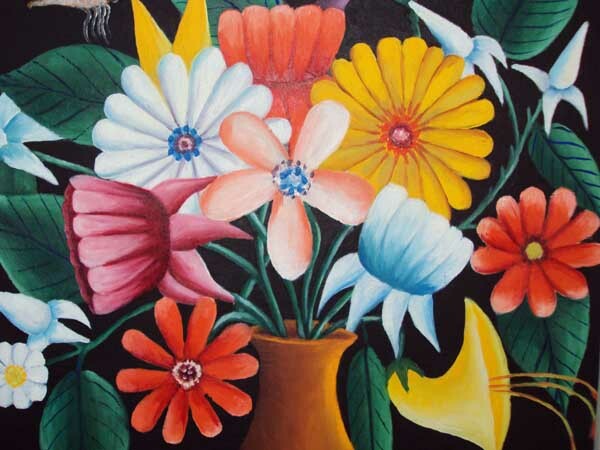 Eventually he began to paint and in 1947 was one of the eight "primitive" painters selected to paint the landmark murals in the Trinity Episcopalian church. In 1955 he won the grand prize in an international art competition sponsored by Alcoa and in 1957 received $1000, an impressive sum, as the winner of an art contest sponsored by Holiday Magazine. He died prematurely in 1965. Issa el Saieh, the legendary dealer , a Palestinain, often pleaded guilty to killing him. It seems that when Bazile was hospitalized and needed a blood transfusion, Issa and his good friend, American Leon Shalom, both volunteered to donate blood. "Thats what killed him, the blood of a Jew and an Arab mixed together", Issa bellowed. This painting is not only a gem but also has a special provenance. It is owned by the American painter, sculptor, illustrator, and educator, James Kearns, who aquired it from Selden Rodman, in the early 1950's. The two men were friends and often traded or gifted one another works of art. 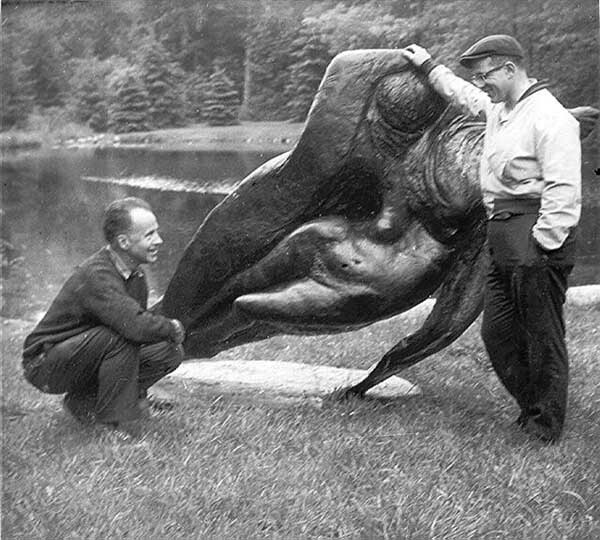 Below is a photo of the two in Rodman's garden in the 1970's with Kearns; sculpture. "Hedonists"
Mr. Kearns also has works by Louverture Poisson, Robert St. Brice, George Liautaud and Janvier Louisjuste that were gotten from Selden. 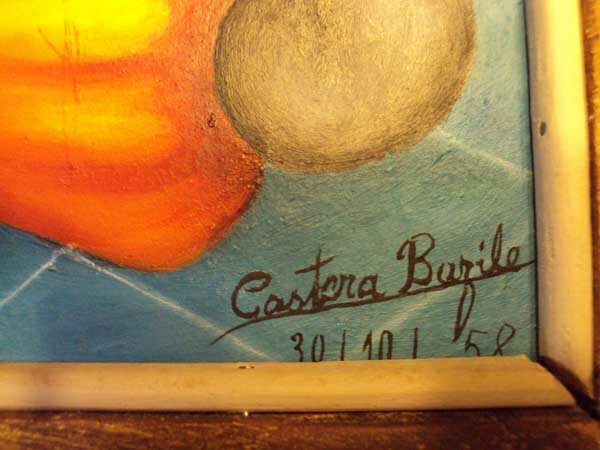 This painting is dated on the lower right under the signature 30/10/58. 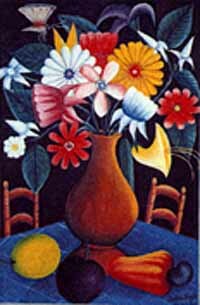 It was acquired in Port-au-Prince in 1959 and has resided in a Wisconsin collection since then.